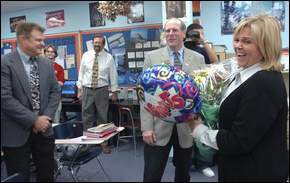 Florida high school English teacher Sue Propert has won a number of prestigious awards including her District's most recent "Teacher of the Year." Lee County’s teachers union has pledged to offer legal support if the school district doesn’t clear its 2006 Teacher of the Year of an ethics violation. Sue Propert, an English teacher at Cape Coral High, wants a letter of reprimand purged from her personnel file. A district investigation found her in violation of Florida’s code of ethics and professional standards for a writing assignment she gave students last spring. The Teachers Association of Lee County’s executive board voted Monday night to offer assistance if Propert’s appeal is denied, and the case heads to arbitration. The district has not yet ruled on her appeal. In the writing assignment, Propert asked students to write about the “New Cape Coral High School,” a concept championed by then-Principal Charles Dailey to reflect a changed school climate. The essays were mostly negative, though, and Propert showed responses to fellow teachers and a school board member. Dailey, who is now west zone transportation director, filed the ethics complaint last May. Dailey himself is under investigation, too, after a parent says he showed up at her workplace to get her fired as payback for sending a critical letter to school board members. I predict that Propert has an uphill battle ahead of her. It's been my observation that when it comes to the disciplining of teachers, school boards are usually reluctant to overturn the recommendation of the district's superintendent. ---------------------------------See our latest education-related posts right here. See today's edition of The Carnival of Education, guest hosted this week by MathandText, over there. The Latest EduDebate: More Hot Multi-Blog Action!